This eye-opening book shows how the rights of workers to safe and healthful workplaces are under greater attack today than at any time since the passage of the landmark Occupational Safety and Health Act in 1970. This collection is organized around three thematic issues that pose significant challenges to the Occupational Safety and Health Administration's ability to protect workers' safety and health. First, the economy has shifted from an industrial base to a white collar/service base, which includes more women workers than ever before - yet many of the safety and health problems that affect women are not being adequately addressed. Second, free market ideology and globalization have served to undermine worker safety and health laws. And finally, the effects of 9/11 have exacerbated the trend toward weakening workers' rights and safety standards in the name of national security. 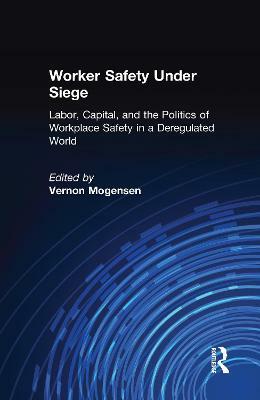 Buy Worker Safety Under Siege by Vernon Mogensen from Australia's Online Independent Bookstore, Boomerang Books.